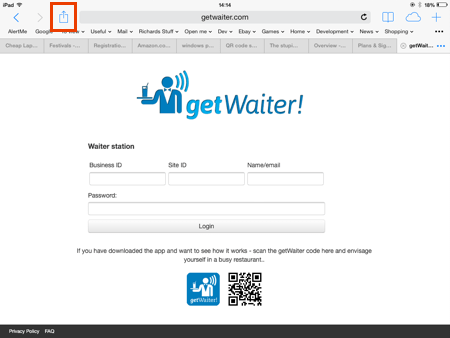 The waiter calling and customer experience tracking tool. 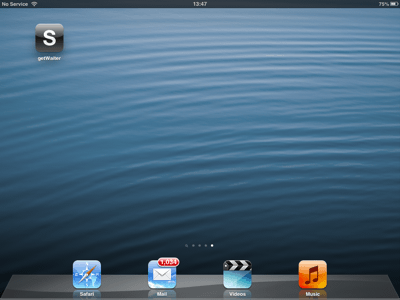 Setting up an iOS (Apple) device. What help is on this page? Preventing the device from going to sleep. 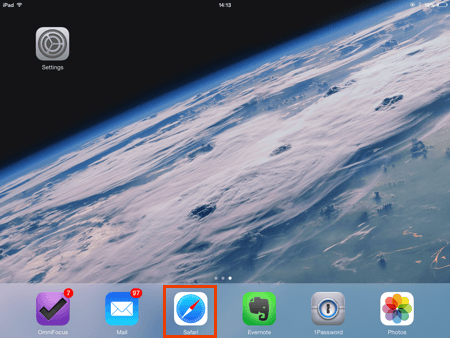 Creating a getWaiter short-cut on the home screen. 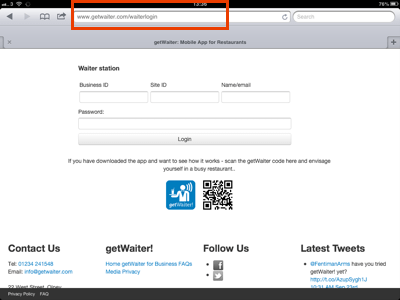 Automatically launching getWaiter when I start my device. 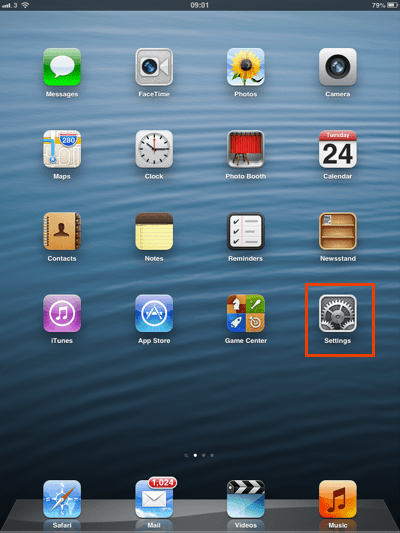 iOS6 does not have the ability to automatically update the apps and OS. 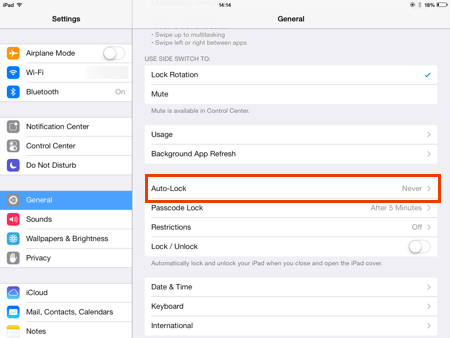 Now tap on the General tab on the left and then the Auto-Lock setting on the right. Tap on the Never line so we can see a tick mark on the right and then on the General button at the top. 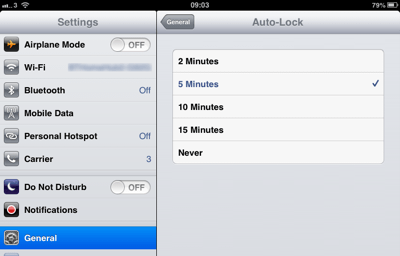 The iPad should never go to sleep unless you manually turn it off. 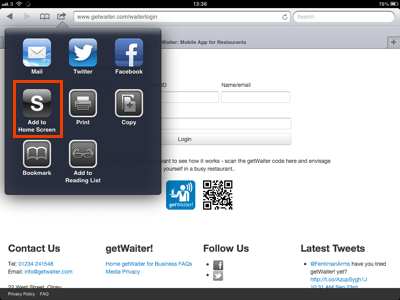 Creating a short-cut on the desktop to the getWaiter! homepage - iOS6. 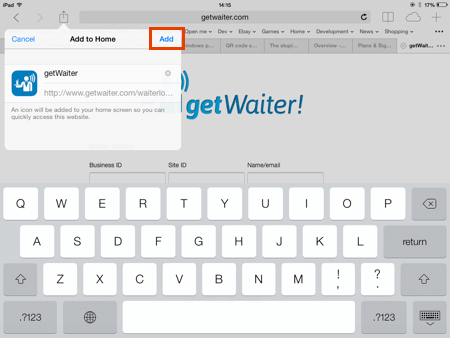 Type the getWaiter! 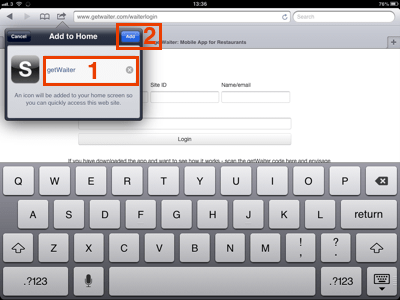 waiter login page (www.getwaiter.com/waiterlogin) into the address bar at the top of the page and press Go on the keyboard to load the page. The page should load and look something like this. Tap on the share/open with icon at the top of the screen. 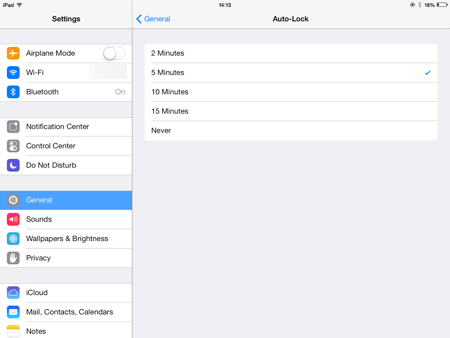 A list should pop up with a number of options, we need to select the 'Add to Home Screen' option. You will now see the icon that will be added to the home screen along with the name, you can change the name of the short-cut if you want to. Tap the 'Add' button once you have done. You will now see the short-cut to the getWaiter! 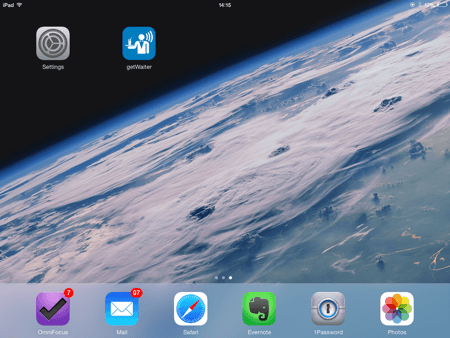 login page on you home screen. 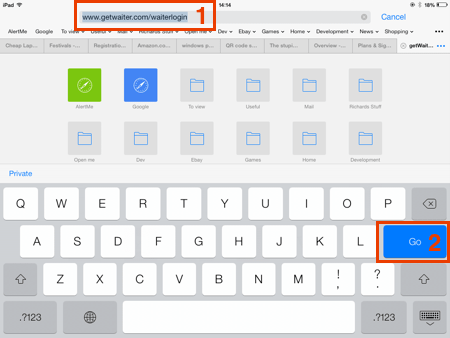 Tapping on this will open safari ready for you to log in. 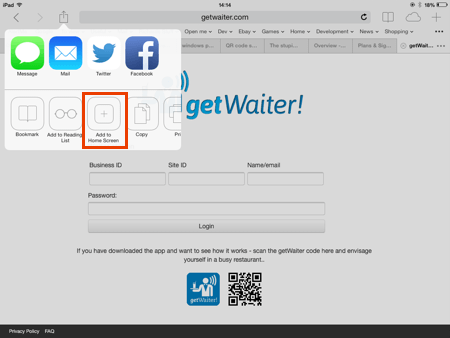 Note these screen shots were taken before we had added the getWaiter logo, the icon should show the getWaiter logo like the iOS7 example below. 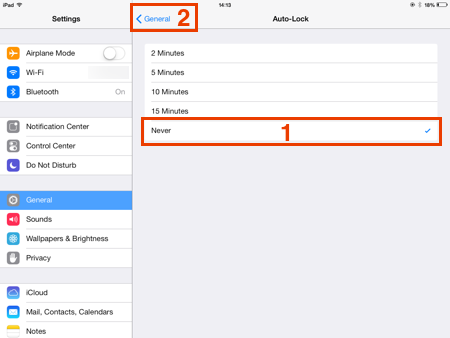 You can use the same process to add other short-cuts to the home screen. We are looking into this, look for an update soon. 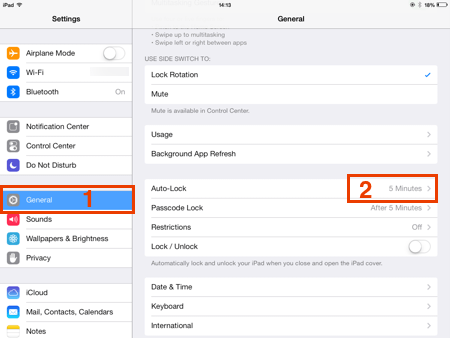 One of the new features of iOS7 is to automatically update apps in the background. 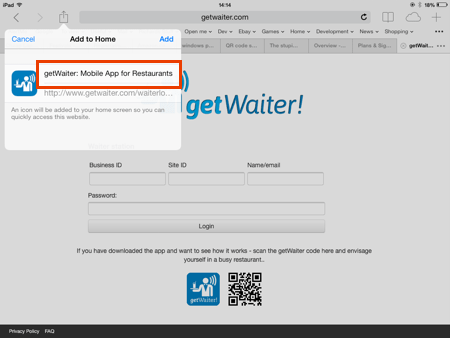 As this only applies to apps it should not affect the operation of getWaiter! on the device unless you are using a third party browser. Follow the instructions below if automatic updates cause you an issue and you want to turn them off. Scroll down the list of settings on the left until you can see 'iTunes & App Store", tap on this to show the automatic download settings. 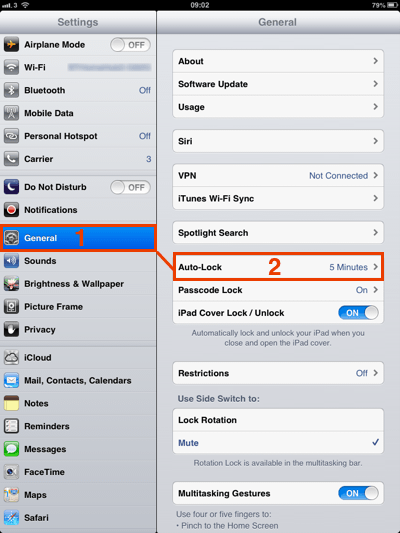 There are a number of automatic download settings, some may be on others off. For the most reliable getWaiter! operation turn all the automatic download options off. 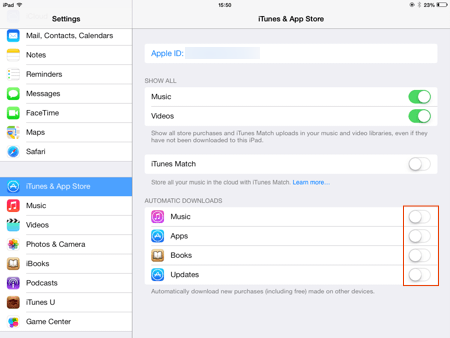 To manually update simply update using the app store as usual. 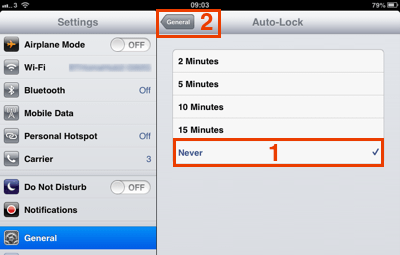 The Auto-Lock should now show 'Never'. The page should load and look something like this. Tap on the share/open with icon at the top of the screen.